The Overpass collapsed according to sources. The overpass was undergoing reconstruction, evidently it was jacked up when the collapse occurred. So, they just set concrete barriers in a traffic lane without any channelization devices before them? Italian motorways are renowned for short, tight merges and narrow lanes. 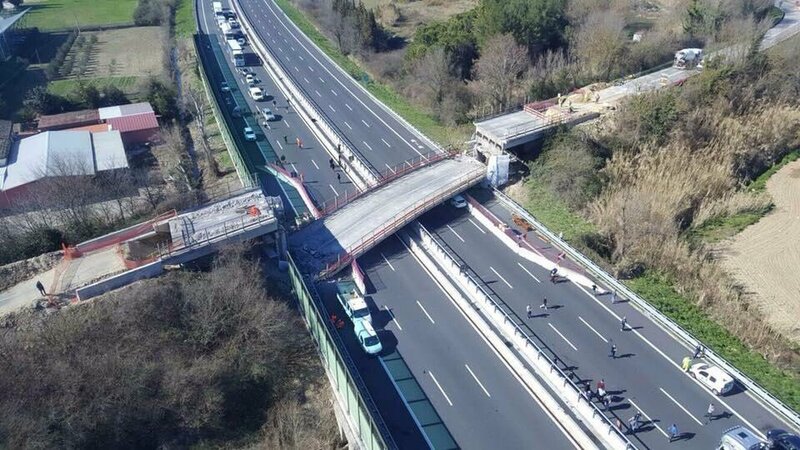 Yes, in Italy you'll notice that the median barrier is generally almost on the edge of a driving lane. Though full left shoulders are uncommon almost anywhere in Europe. Usually it's some 0.5 - 1.5 m (2-5 ft). Left shoulders seem to be a North American design standard. The Netherlands also mandated it with motorway design standards (if there are 4 or more lanes in one direction) but in most cases they've been turned into driving lanes or omitted due to cost.